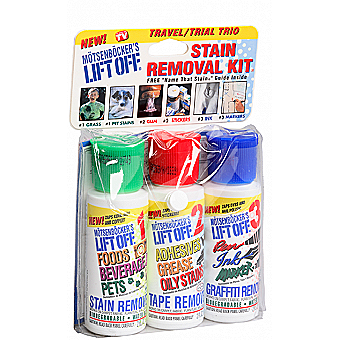 This perfect starter kit for stain, tape & marker removal, includes a 2 oz. bottle of the Mötsenböcker’s Lift Off® #1, 2 & 3 formulas. Tea • Juice • Kool–Aid® • Soda • Lipstick • Tar & Sap • Salad Dressing • Correction Fluid • Mayonnaise • Wine • Wax • Inks • Crayons • Chalk • Tape • Food Stains • Adhesives • Coffee • Pets • Nail Polish & More! Carpets • Fabrics • Clothes • Fiberglass • Tile • Furniture • Vinyl • Cars • Wall Coverings • Wallpaper • Floors • Walls • Counter–tops • Tools • Shoes • Upholstery • Concrete • Furniture • Desks • Office Equipment • Plastics • Hands & More!